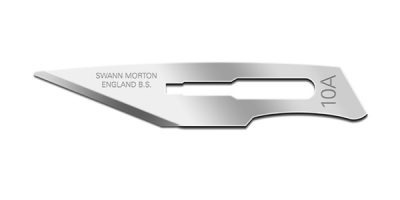 Swann Morton Premium Retractaway Craft Knife. A sleek retractable blade handle offering the added safety of a retracting mechanism that comes with five no. 10A blades. 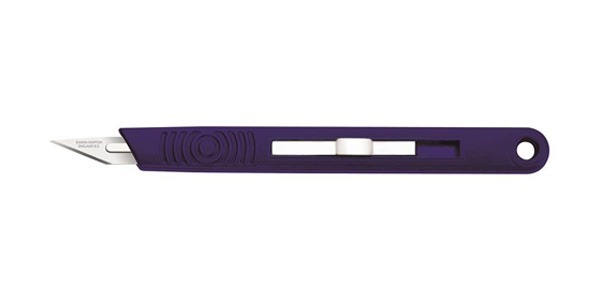 The Premium Retractaway craft knife offers the added safety of a hand retractable blade mechanism. It is a highly versatile cutting tool produced with designers, graphic artists and model makers in mind. With easy blade changing it fits and safely retracts surgical blade Nos. 10, 10A, 11, 15 and 15A. The Premium Retractaway is easily recognizable with its Reflex Blue handle. The craft knife features a more durable stainless steel bayonet providing the user with additional lateral strength and longevity of use. Handle packaged with five 10A blades.